Consisting of 500mAh TPOD battery and 2ml TPOD refillable pod, the Tesla TPOD kit is a compact and portable AIO pod kit with fashionable watch style design. With a unique 1.2ohm coil head, the TPOD starter kit is perfectly compatible with salts. Please Note this product is Shipped directly to you from China, local custom charges may apply, contact your customs office for more details. 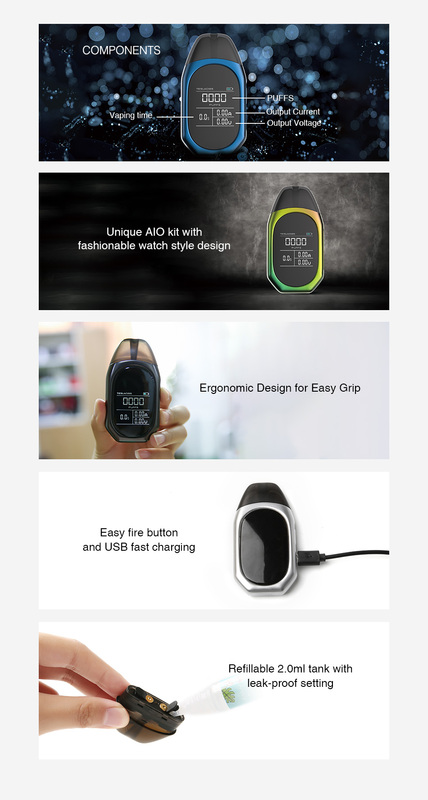 The new Tesla TPOD Kit is a unique AIO starter kit with a fashionable watch style design and a simple large screen. With the compact size and smooth curve design, the TPOD Kit is comfortable in the hand and easy to carry. Consisting of a 500mAh built-in battery and a 2ml refillable pod cartridge with an easy fire button with USB fast charging. The TPOD Kit will bring you a simple yet amazing vaping. The TPOD Starter Kit also comes with a powerful 1.2ohm coil head which can apply to nicotine salts perfectly. Just get the TPOD small smok device and enjoy a happy vape.